This article is about mathematics. For astronomy of galaxies, see galaxy group. 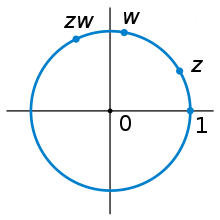 The circle of center 0 and radius 1 in the complex plane is a compact Lie group with complex multiplication. In mathematics, a compact (topological) group is a topological group whose topology is compact. Compact groups are a natural generalization of finite groups with the discrete topology and have properties that carry over in significant fashion. Compact groups have a well-understood theory, in relation to group actions and representation theory. In the following we will assume all groups are Hausdorff spaces. The classification theorem of compact Lie groups states that up to finite extensions and finite covers this exhausts the list of examples (which already includes some redundancies). This classification is described in more detail in the next subsection. Theorem: Every connected compact Lie group is the quotient by a finite central subgroup of a product of a simply connected compact Lie group and a torus. or one of the five exceptional groups G2, F4, E6, E7, and E8. The restrictions on n are to avoid special isomorphisms among the various families for small values of n. For each of these groups, the center is known explicitly. The classification is through the associated root system (for a fixed maximal torus), which in turn are classified by their Dynkin diagrams. The classification of compact, simply connected Lie groups is the same as the classification of complex semisimple Lie algebras. 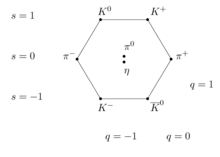 Indeed, if K is a simply connected compact Lie group, then the complexification of the Lie algebra of K is semisimple. Conversely, every complex semisimple Lie algebra has a compact real form isomorphic to the Lie algebra of a compact, simply connected Lie group. belongs to a maximal torus and that all maximal tori are conjugate. has been chosen, one can define a root system and a Weyl group similar to what one has for semisimple Lie algebras. These structures then play an essential role both in the classification of connected compact groups (described above) and in the representation theory of a fixed such group (described below).
. The second approach uses the root system and applies to all connected compact Lie groups. Amongst groups that are not Lie groups, and so do not carry the structure of a manifold, examples are the additive group Zp of p-adic integers, and constructions from it. In fact any profinite group is a compact group. This means that Galois groups are compact groups, a basic fact for the theory of algebraic extensions in the case of infinite degree. Pontryagin duality provides a large supply of examples of compact commutative groups. These are in duality with abelian discrete groups. Compact groups all carry a Haar measure, which will be invariant by both left and right translation (the modulus function must be a continuous homomorphism to positive reals (ℝ+, ×), and so 1). In other words, these groups are unimodular. Haar measure is easily normalized to be a probability measure, analogous to dθ/2π on the circle. Such a Haar measure is in many cases easy to compute; for example for orthogonal groups it was known to Adolf Hurwitz, and in the Lie group cases can always be given by an invariant differential form. In the profinite case there are many subgroups of finite index, and Haar measure of a coset will be the reciprocal of the index. Therefore, integrals are often computable quite directly, a fact applied constantly in number theory. The representation theory of compact groups (not necessarily Lie groups and not necessarily connected) was founded by the Peter–Weyl theorem. Hermann Weyl went on to give the detailed character theory of the compact connected Lie groups, based on maximal torus theory. The resulting Weyl character formula was one of the influential results of twentieth century mathematics. The combination of the Peter–Weyl theorem and the Weyl character formula led Weyl to a complete classification of the representations of a connected compact Lie group; this theory is described in the next section. The unknown part of the representation theory of compact groups is thereby, roughly speaking, thrown back onto the complex representations of finite groups. This theory is rather rich in detail, but is qualitatively well understood. Certain simple examples of the representation theory of compact Lie groups can be worked out by hand, such as the representations of the rotation group SO(3), the special unitary group SU(2), and the special unitary group SU(3). We focus here on the general theory. See also the parallel theory of representations of a semisimple Lie algebra. Throughout this section, we fix a connected compact Lie group K and a maximal torus T in K.
satisfying this condition is called an analytically integral element. This integrality condition is related to, but not identical to, the notion of integral element in the setting of semisimple Lie algebras.
. The strategy of the representation theory of K is to classify the irreducible representations in terms of their weights. (4) every dominant, analytically integral element arises as the highest weight of an irreducible representation. comes from a representation of the group K.) On the other hand, if K is simply connected, the set of possible highest weights in the group sense is the same as the set of possible highest weights in the Lie algebra sense. is determined by its restriction to T.
The study of characters is an important part of the representation theory of compact groups. One crucial result, which is a corollary of the Peter–Weyl theorem, is that the characters form an orthonormal basis for the set of square-integrable class functions in K. A second key result is the Weyl character formula, which gives an explicit formula for the character—or, rather, the restriction of the character to T—in terms of the highest weight of the representation. In the closely related representation theory of semisimple Lie algebras, the Weyl character formula is an additional result established after the representations have been classified. In Weyl's analysis of the compact group case, however, the Weyl character formula is actually a crucial part of the classification itself. Specifically, in Weyl's analysis of the representations of K, the hardest part of the theorem—showing that every dominant, analytically integral element is actually the highest weight of some representation—is proved in totally different way from the usual Lie algebra construction using Verma modules. In Weyl's approach, the construction is based on the Peter–Weyl theorem and an analytic proof of the Weyl character formula. Ultimately, the irreducible representations of K are realized inside the space of continuous functions on K.
. Thus, we recover much of the information about the representations that is usually obtained from the Lie algebra computation.
. We focus on the most difficult part of the theorem, showing that every dominant, analytically integral element is the highest weight of some (finite-dimensional) irreducible representation. norm of the character is 1. Specifically, if there were any additional terms in the numerator, the Weyl integral formula would force the norm of the character to be greater than 1.
, and these functions are orthonormal. must actually be the highest weight of a representation. The topic of recovering a compact group from its representation theory is the subject of the Tannaka–Krein duality, now often recast in term of tannakian category theory. The influence of the compact group theory on non-compact groups was formulated by Weyl in his unitarian trick. Inside a general semisimple Lie group there is a maximal compact subgroup, and the representation theory of such groups, developed largely by Harish-Chandra, uses intensively the restriction of a representation to such a subgroup, and also the model of Weyl's character theory. ^ Peter, F.; Weyl, H. (1927), "Die Vollständigkeit der primitiven Darstellungen einer geschlossenen kontinuierlichen Gruppe", Math. Ann., 97: 737–755, doi:10.1007/BF01447892 .